The competition, called by the Latteria Sociale Valtellina S.C.A. cooperative dairy, was aimed at renovating the old building, adding a new space to incorporate a sales outlet, restaurant, conference room and a small museum. Located in the municipality of Postalesio in the province of Sondrio, the project is an opportunity for Piuarch to make the most of the landscape and the economic and historic context of the area. 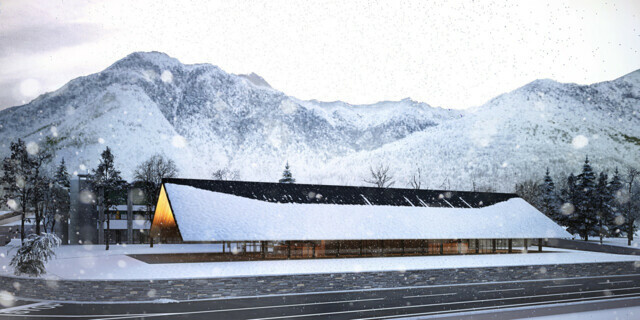 The basic concept behind the winning proposal is a reinterpretation of the malga – a traditional Alpine structure – characterized by a long, low profile, inside which there are spaces for the sales outlet, a show room and work area. The building proposed by Piuarch is 54 metres long, with a single large roof with a front and side overhang that creates an area of approximately 1,000 m2, with 340 m2 of outside covered spaces. The interior spaces radiate outwards from the centre of the floor plan, communicating with the outside in three different ways. The central core is entirely closed in and consists of the conference room and the service facilities, changing rooms and kitchens. The reception areas for customers are arranged along the perimeter: the outlet, café/bar, restaurant and museum area, all placed in a continual line designed to encourage the mixing of functions and involving visitors. The third level of communication between interior and exterior spaces is represented by the outside covered areas: the 9-metre overhang at the front creates a covered piazza, and along the sides the roof slopes down to just 2.20 metres, providing a 3-metre overhang. This not only facilitates access to the sales outlet, it also provides a pleasant alfresco area for tasting products and socializing. The large windows around the entire perimeter allow the building to breathe and keep the interior functions in continual direct contact with the outside, inviting one to stop and pay a visit. 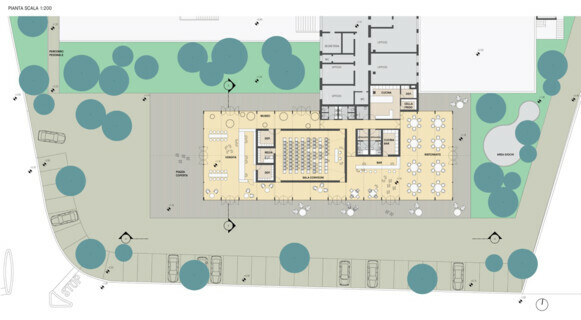 The invited competition asked for the existing building to be enlarged, adding another floor and creating a new façade that would unite the entire surface. Piuarch proposed a design in which the entire increase in volume was transferred to the ground, completely disregarding the request. Perhaps not a very orthodox stance, but one that was rewarded by the jury, who recognized both the landscape and functional value of the design proposed. The choice to arrange the spaces in a single long front actually gives better visibility, simplifies circulation, increases flexibility of use, and makes the adding of any vertical connections unnecessary. 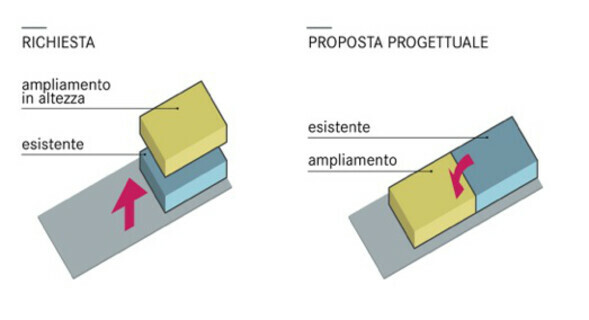 The elevation of the floor of the new space matches that of the existing building, and the new structures keep to the same structural axes of the original volume. The elongated structure facilitates visits, the use of services, the understanding of the narrative flow and the exchanges among the various functions. Furthermore, the building lacks any architectural barriers both at the outside entrances and in the interior spaces, as it was designed according to Design for All principles. A Design for All project means designing rooms, areas, systems and services so that they can be enjoyed independently by people with different needs and abilities. People are not classified according to a functional category; instead the environment is designed so it is able to communicate with most people without the need to modify anything according to their different physical, sensorial or cognitive abilities. The choice of materials respects the authentic concept of the malga and clearly attempts to reduce the environmental impact to a minimum. The raw materials have been selected from those found locally: both to harmonize the aesthetics with the historic culture of the buildings and to facilitate the obtaining of supplies and to reduce costs. The roof is in sheet metal, the facing is in local stone, and the structural beams are made from laminated wood. 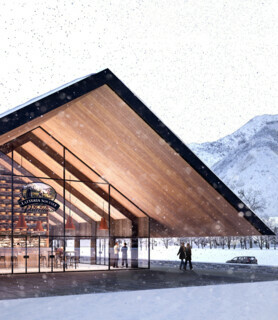 The main feature of the new Latteria Sociale della Valtellina is its long roof, with pitches sloping almost down to the ground, making it blend in with the natural slopes of the land: almost as though it were a hat providing protection from the winter snow or summer sun. Highlighting even further Piuarch’s choice of dialogue with the surrounding landscape and historic, cultural and material setting is the design of the lighting. The large lamps lighting and decorating the interior of the dairy take their inspiration from the culdera, the traditional copper cooking pot shaped like an upside-down bell, used to mix cow’s and goat’s milk, and heated over a wood fire in a fireplace. A tribute to the shepherds’ traditions and to the area’s inexhaustible ability to give shape to its expertise.